EMCOR Group, Inc. (NYSE: EME), a Fortune 500® leader in mechanical and electrical construction, energy infrastructure and building services for a diverse range of businesses, today announced it received a fourth safety award in recent years from commercial insurance leader CNA for the company’s outstanding efforts promoting safety innovation in the construction and services industries. 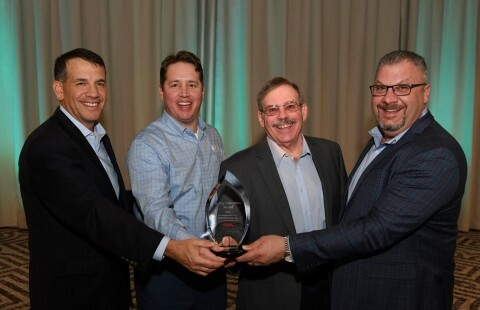 The award was presented at EMCOR’s 2019 Safety Conference in Orlando, Florida; Tony Guzzi, Chairman, President and CEO of EMCOR Group, Inc. and Matthew Pierce, EMCOR’s Vice President for Safety, Quality and Productivity, accepted the award from CNA Assistant Vice President, Risk Control, Brian Roberts and Jay Karamanol, CNA’s Risk Control Consulting Director. A Fortune 500® company with estimated 2018 revenues of ~$7.9B, EMCOR Group, Inc. (NYSE: EME) is a leader in mechanical and electrical construction, industrial and energy infrastructure, and building services. A provider of critical infrastructure systems, EMCOR gives life to new structures and sustains life in existing ones by its planning, installing, operating, maintaining, and protecting the sophisticated and dynamic systems that create facility environments—such as electrical, mechanical, lighting, air conditioning, heating, security, fire protection, and power generation systems—in virtually every sector of the economy and for a diverse range of businesses, organizations, and government. EMCOR represents a rare combination of broad reach with local execution, combining the strength of an industry leader with the knowledge and care of 170 locations. The ~36,000 skilled employees of EMCOR have made the company, in the eyes of leading business publications, amongst the “World’s Most Admired” and “Best Managed." EMCOR’s diversity—in terms of the services it provides, the industries it serves, and the geography it spans—has enabled it to create a stable platform for sustained results. The Company’s strong financial position has enabled it to attract and retain among the best local and regional talent, to undertake and complete the most ambitious projects, and to redefine and shape the future of the construction and facilities services industry. Additional information on EMCOR can be found at www.EMCORGroup.com.